Few company names are more instantly recognizable in the lawn care industry than “Weed Man.” Since 1970, Weed Man has grown from a single location in Mississauga, Ontario to an international network of more than 250 franchises throughout Canada, the United Kingdom and the United States. 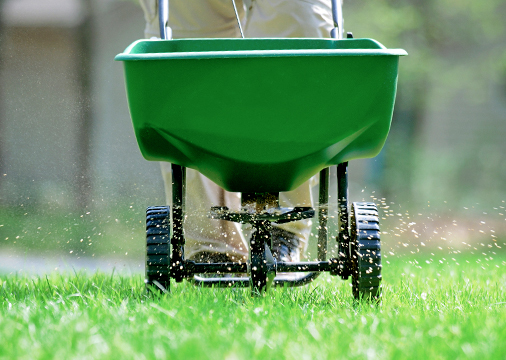 Although the company’s original focus was on weed control, today, Weed Man emphasizes the development of thicker, healthier lawns through a well-balanced, high-quality fertilization program. Corbin Schlatter’s Weed Man USA franchise in Columbus, Ohio follows the company’s successful business model, offering fertilization, weed control, insect control and disease treatments. Schlatter and his wife, Audrey, own and manage their Central Ohio franchise, overseeing product and equipment purchases and marketing efforts. They currently have 25 full-time employees with that number rising significantly during the spring and summer months. In 2017, they received the Weed Man USA Award of Excellence, achieving net sales of $2 million while expanding their territory into Greene County and Dayton, Ohio. One of the quality products that Schlatter chooses for his customers is XCU® slow-release fertilizer from Koch Turf & Ornamental. With the highest nitrogen (N) content (43 percent) and the lowest sulfur content (4 percent) of any polymer-coated, sulfur-coated urea (PCSCU) on the market, XCU® provides gradual, steady nutritional uptake for up to 10 weeks of plant response. Lawn care companies that apply XCU® can cover more area per application while using less fertilizer. Schlatter’s Weed Man USA lawn care program consists of six visits throughout the year. The first visit of the year each spring includes an XCU® fertilizer application with a grassy weed pre-emergent. Next comes a broadleaf weed control application plus crab grass prevention. Visits 3 and 4 are granular XCU® applications with spot weed treatments; visit 5 is a liquid broadleaf weed control application. Finally, visit 6 is a final granular XCU® application in the fall. Thanks to XCU®’s slow-release properties, Schlatter’s crews have been able to apply less fertilizer to their customers’ lawns while still maintaining beautiful, healthy turf. Because XCU® lasts longer, they’ve modified their application rates to ensure optimal performance, applying heavier rates in the spring and fall and a lighter rate in the summer. Schlatter’s technicians also appreciate XCU® for its performance and the ease with which it flows from the spreader. And, it’s less dusty than other granular fertilizers, which further improves their working conditions.